In: Scientific American, May 2001. In: Communications of the ACM, Vol 44, 4, 2001. Knowledge of a programming language as can be obtained from INFO I110, INFO I210, or similar courses. Recommended prerequisite or concurrent: INFO I201. Basic knowledge of how to use the WWW. Each class session consists of lectures, class discussions, and in-class exercises, which the students will work on in small teams. Besides the in-class exercises, assignments are given for each week that the students are expected to complete (with the help of the assigned readings) before the weekly meetings. The assignments will be discussed in class. The students will work on a semester-long team project that they will present during the last class session. A readings package will be available from the IU bookstore. Some of the readings are not included in the readings package but instead are on-line linked to this syllabus. To read the on-line ACM readings, students must use a computer that belongs to the indiana.edu domain because the ACM digital library may not be available otherwise. Class contribution includes the quality and quantity of contributions to the work of the class. The students are expected to complete the assignments and readings of each week before the class meeting (except for the first week). If a student misses a class, he/she will hand in that week's assignment, which will not be graded but will ensure that the student does not fall behind in the class. Participation in the discussion of assignments and readings will be a large proportion of the class participation grade. It is required that every student demonstrates respect for the ideas, opinions, and feelings of all other members of the class. A majordomo mailing list will be used to communicate about course matters. The students should send comments and questions concerning the reading materials and the assignments to this list. Students are expected to post a minimum of on average one message per week. The mailing list is upriss_i200@indiana.edu. The students will work on a semester-long team project. Each team will design an information system for the materials covered in this class. The system can be web-based or use a more traditional paper-based format. 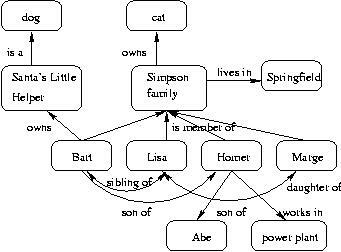 Each system must design three different means of information representation or access, such as classification system, graphical representation, database, metadata, ontology or others, as discussed in this class. The information to be represented consists of the topics and readings discussed in this class. Each information system must be well documented and will be handed in during the last class meeting. Each team will present their system during the last class meeting. The exam will be a take-home exam. Three multiple choice tests will be handed out during the semester. They will be announced in advance on the class mailing list. Analyze the methods of information representation and information access in a phone-book. Pay special attention to the yellow pages. How are they organized? Which possibilities of information retrieval offers a phone-book on CD-ROM compared to a printed phone-book? What are equivalent services on the WWW? What are the user expectations of these types of information systems? Describe the use of tools such as "knife", "fork", and "cup" during the process of "eating a meal" in a semi-formal way. It will be composed of actions, such as "picking up fork", "holding fork", "laying down fork", etc. What are the temporal relationships, i.e. which actions precede or follow which other actions, which actions are simultaneously? You can use a graphical representation similar to Figure 8. in Allen's paper. How can you represent repeating actions? Maintaining knowledge about temporal intervals. Communications of the ACM, 26 (11), 832-843. What is involved in being a webmaster? What software is used on the WWW to facilitate information access, gather statistics, ensure security, etc? What people skills are required of a webmaster? Compare the term (concept) "clothes" in WordNet and Roget's Thesaurus. Analyze the concept "clothes" in CYC.